In this edition of Making Oregon, we feature Jude Gerace, founder of Sugar Wheel Works in Portland. 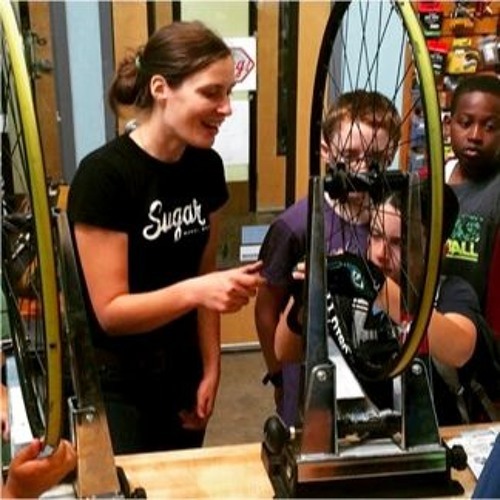 She talks with us about her entrepreneurial story, how she came to love cycling, develop her craft, and the elements behind her drive to make high-quality bike wheels. Jude remembers her first bicycle, a pink, second-hand Schwinn Fair Lady and how it represented the gift of independence. By the age of 14 she had 3 jobs—one of them a business she started herself—complete with a jingle she wrote to attract customers. Jude explains some of the difficult turning points in her life, and how she got from Chicago to Eugene to Portland. She’ll talk about what she learned in her travels, how cycling became not only a passion but a career path, and how she “collects brains” to continually build her expertise. Jude explains what it took to boot strap her business and what happened when her original business name was contested by a larger company. She has a lot to teach us about building a team, especially what she has learned from one of her employees, Dan, a young man who is living with autism. Jude also reveals some of her own ongoing struggles, like the difficulty in achieving the elusive work-life balance, dealing with fear, and how she see thinks about the future growth of her business.